The China page is a bit of a mess at present. Not for the first time on this trip, my blog is banned in China. I find it very difficult and only with some outside help have I been able to add some content which is better than nothing. This is the best I can do for now. I started this morning at 3100 metres and spent the morning climbing towards the Chinese border. 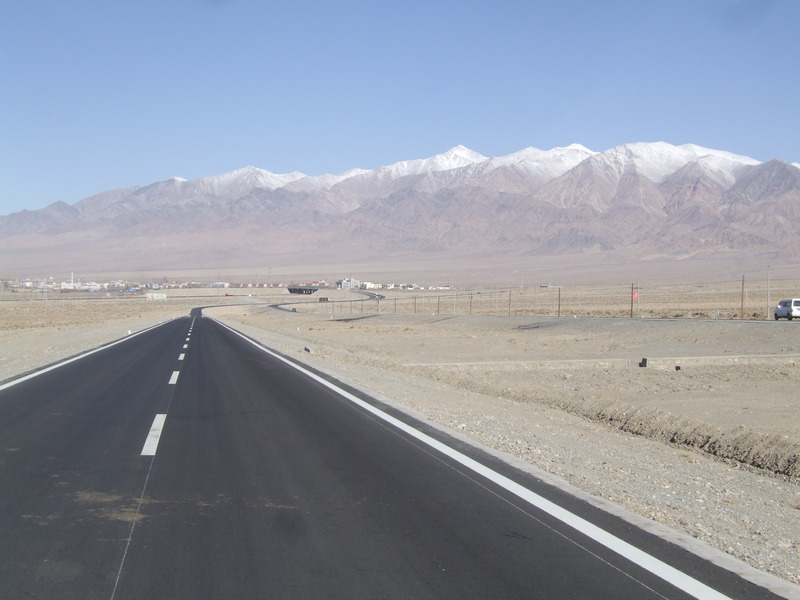 Flanked for 40 km on one side by massive snow-capped mountains that ran into a golden plain. and I rode with them for the rest of the day. We finally got to the border at 2:30 p.m. There were hundreds of trucks queuing up and there were many border guards, the most I have ever seen on a border. Despite looking very hectic, it was a very efficient border. The border guards spoke good English. We didn’t have to fill out an arrival card………….it was all done by computer. At the last counter a computer asks you to select a button ranging from very satisfied to not very satisfied to rate the service……………..I selected very satisfied. Once out the other side we found ourselves in a very dirty and rough looking town. We were all hungry and went into a small restaurant for a plate of steaming hot spice noodles and veggies. 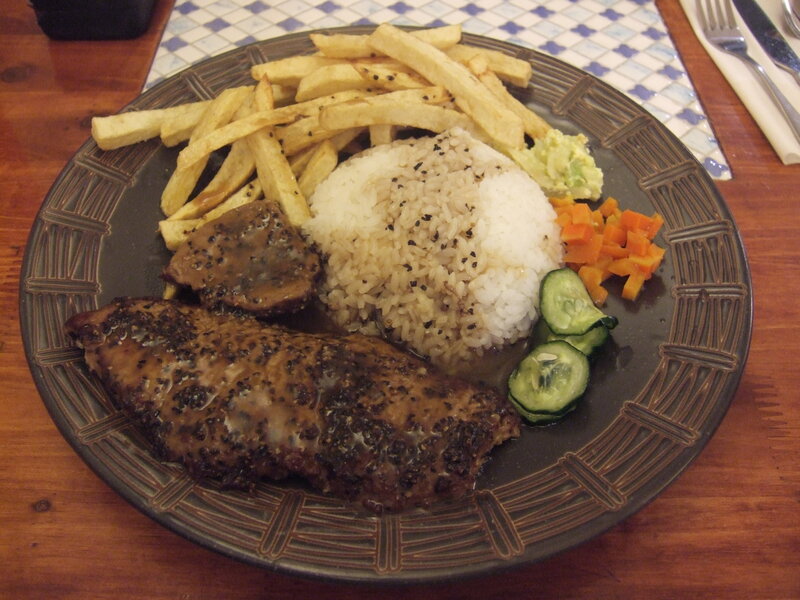 It was very good and made a nice change from the bland rustic food of the Stans. While we ate our dinner we watched the guy chopping up the meat with an axe. After dinner we cycled less than a km down to a river and set up camp on the grazing pastures in front of an old mud village. We had an old local guy come over and see us. He was very friendly and didn’t seem to mind we were there. It was pretty cool waking up in China this morning. Crossing the border has been a nice milestone. China has been the one country I have been least excited about visiting. I guess the size and vast distances I will have to cycle are a bit daunting – at least half of what I have already cycled (5000km) in the next 2-3 months. Now that I am here though I am more enthusiastic. Day 1 in China turned out to be a long and tough day. We started by climbing the Irkesham pass on a very rough and dusty road. We passed through a few towns, but none of them had a real Chinese feel. 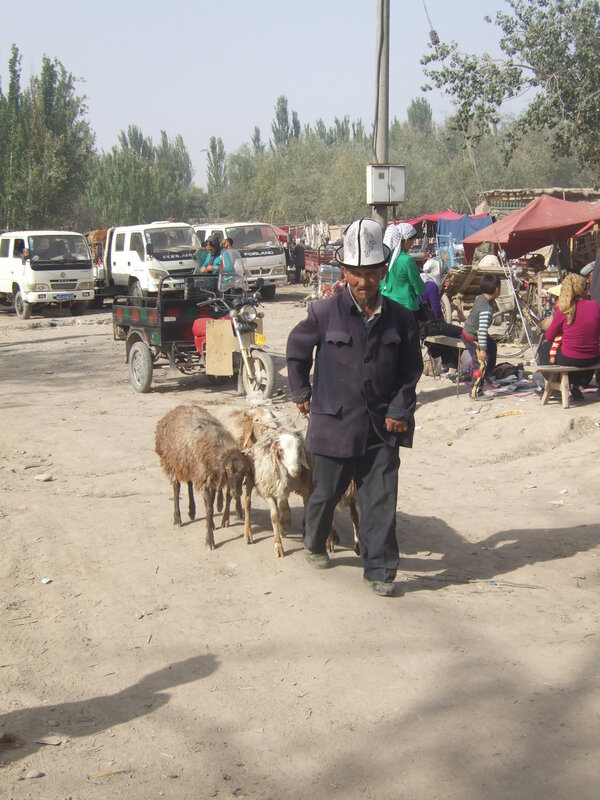 The people were mostly ethnic Uighurs and Kyrgyz. Late in the day we were still 25 km from Kahsu. We had to push on because the Swiss boys had no food or water left. So we had to cycle the last 5 km in the dark which did not please me. 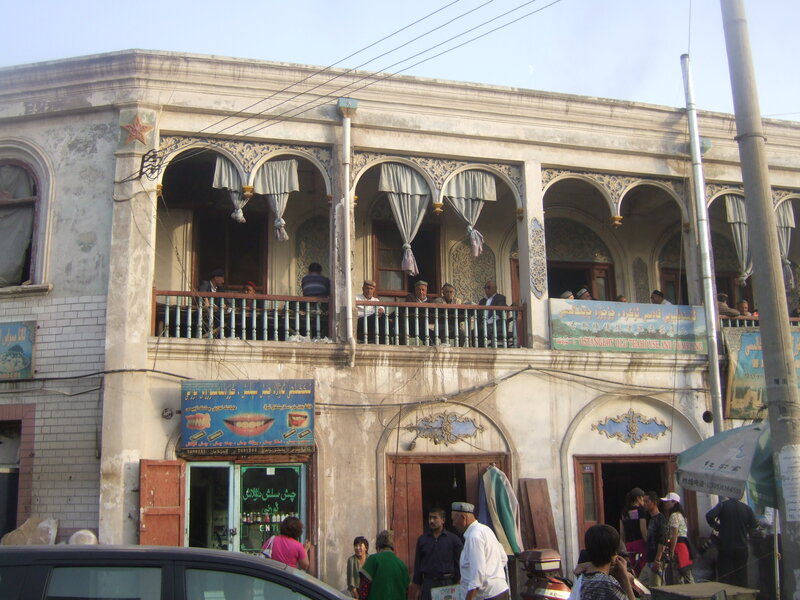 Kahsu was a rough old town……………….we stopped in a restaurant for some dinner and then cycled 1 km out of town till we found a spare bit of land to put the tents up. 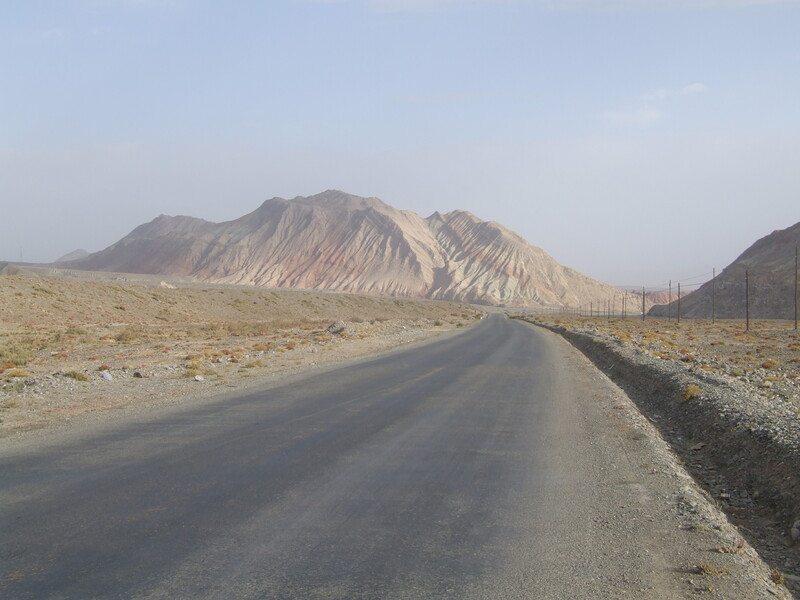 The great thing about reaching Kahsu was that we rejoined the sealed road which made for a good day‘s cycling. This time I left the Swiss guys behind. Up till midday we had done 60 km. 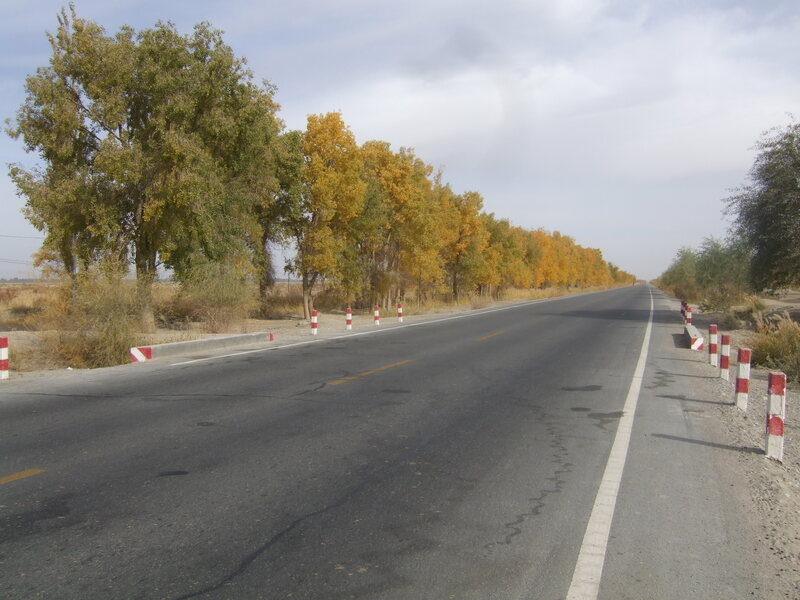 I then put my foot down knowing that after another 60 km and I would be in Kashgar and 7 cycle-free days awaited me. It was a very good incentive to get the bike moving. 2 hours and 15 minutes later I was in Kashgar and 15 minutes later I was in the old town hostel, a real haven for cyclists. 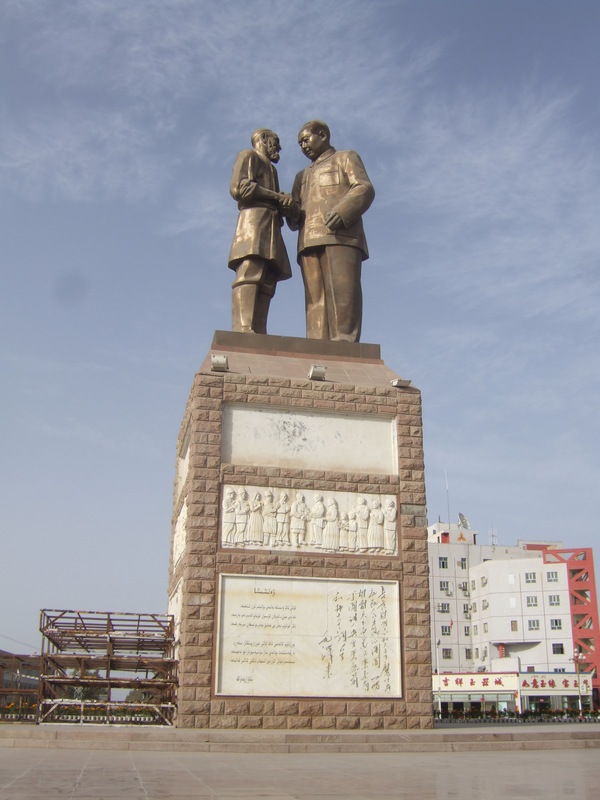 Kashgar is not the real China. It is tucked away in the west of china. 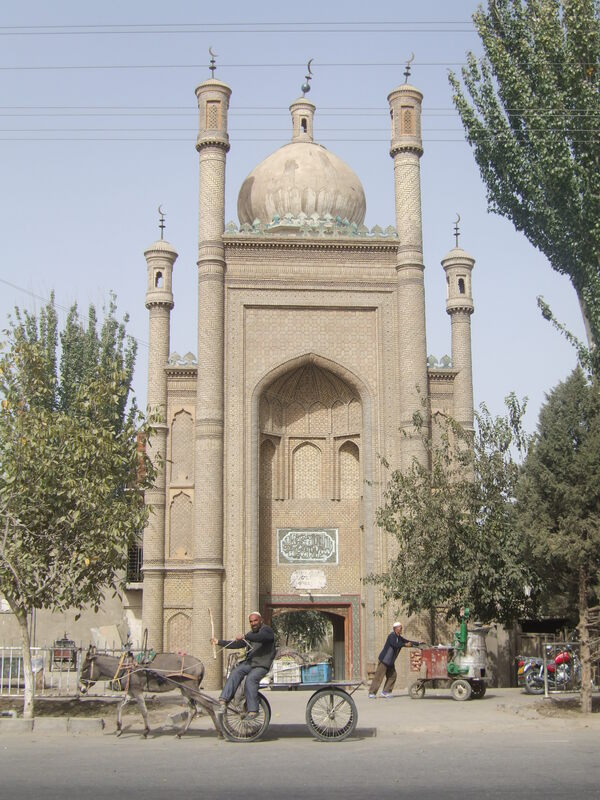 It is predominantly Muslim with most of the people living here Uighurs. Walking the streets of the old town is great. 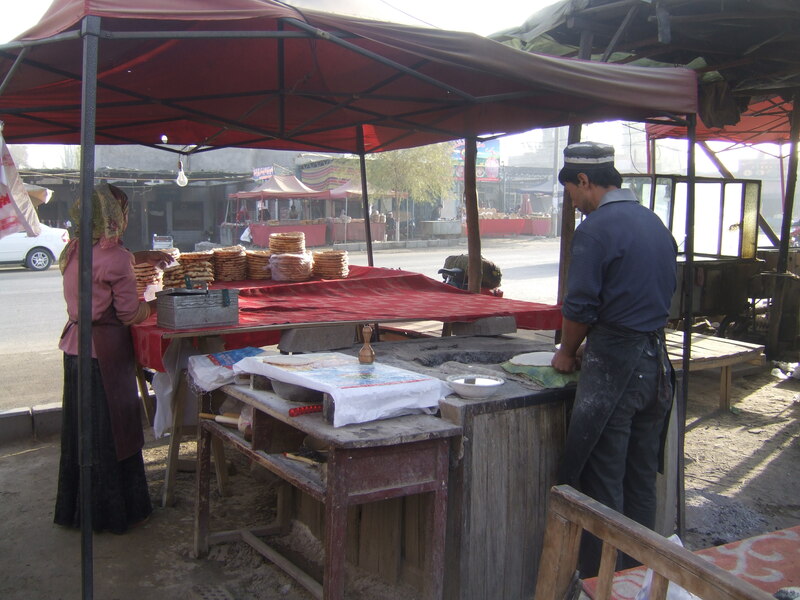 You can buy fresh hot bread as it comes straight out of a clay oven on the side of the street. 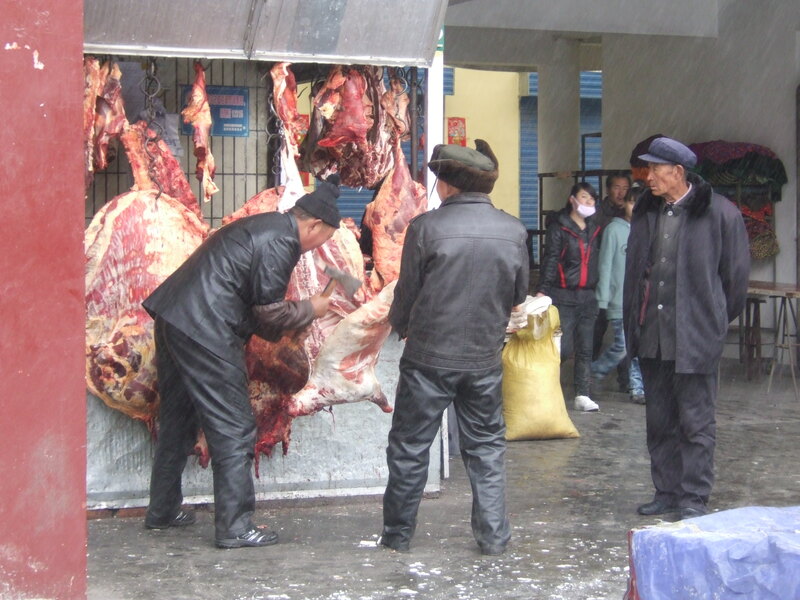 The butcher’s shop is on the street as well with meat hanging up in the open. The axe is at the ready if you want to buy a piece. 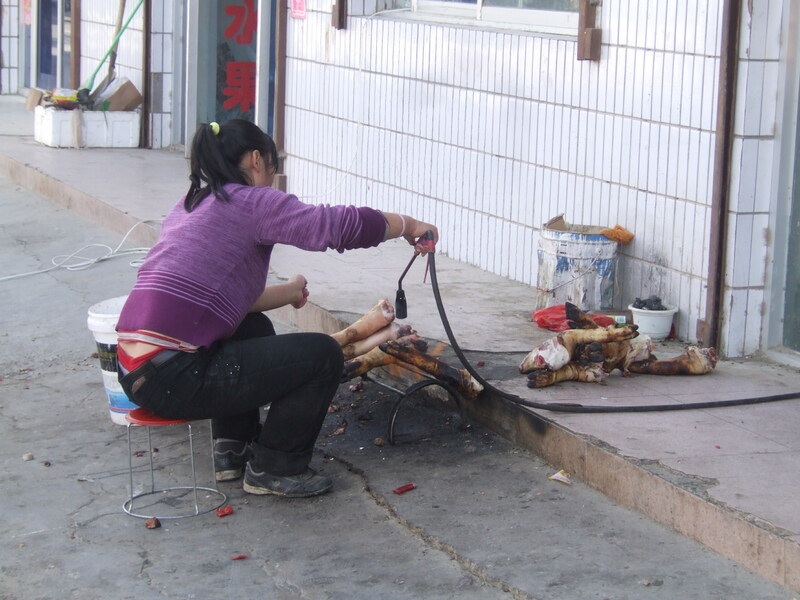 More interestingly, are the guys on the street making copper bowls and other metal instruments. Further along are a group of guys making wooden instruments. The streets are full of motorbikes. But it is relatively quiet because surprisingly they are all electric and you can own one for 200 euros. The old town is changing……..a lot of the very nice old buildings with their nice balconies are getting knocked down by the Chinese. 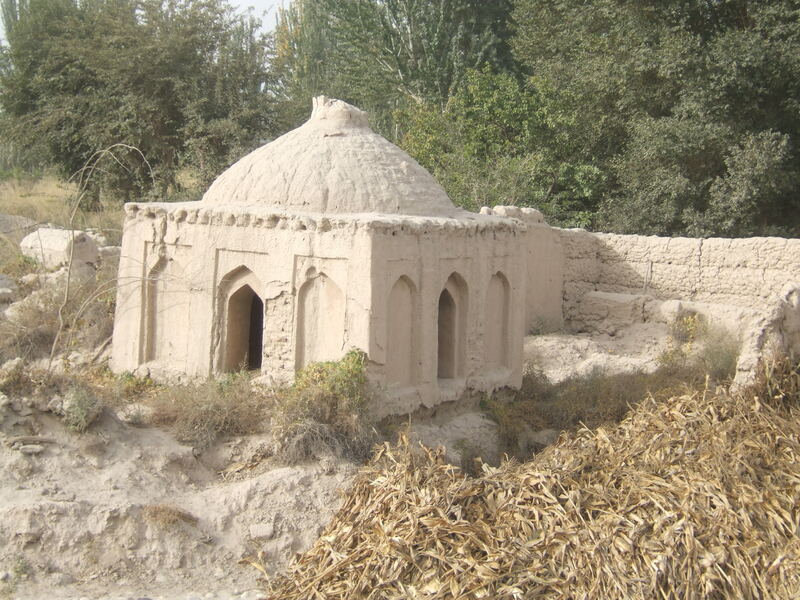 The planned 7 days in Kashgar turned into 9. I was a bit naughty and should have left Saturday but decided to stay and try and listen to the Quarter final games of the World Cup. I logged into Radio New Zealand sport 2 ½ hours before the Wales v Ireland game and thought this is good. Mistake I made was going out for breakfast. When I came back I tried to log back in. It was impossible because it was overloaded. So in the end I had to settle for text update. Sunday I thought I won’t make the same mistake again and logged in 2 ½ hours before the Australia v South Africa game. Disaster struck 1 hour out from the start the internet connection went down and it was all over. I didn’t have a chance to get back on. So for the second day I had to settle for the text updates. Though as soon as the New Zealand v Argentina game finished I got the commentary back which was a bit cruel…………..at least New Zealand won 33-10. I had heard there was a very lively Sunday livestock market. 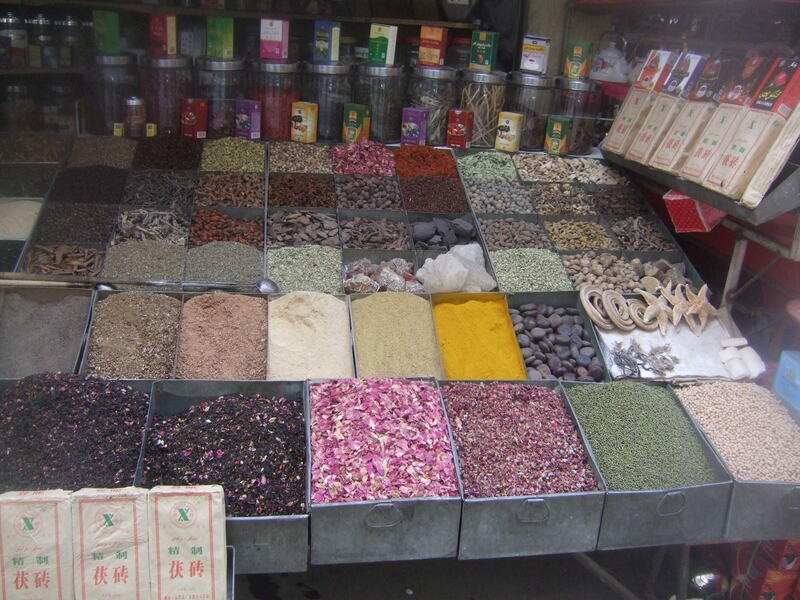 So with a Ukranian guy I last met in Tajikistan we walked out to the market. 5 km later we discovered it had moved the week before to a new location 20 km away. Did find some very nice crisp apples in the bazaar. Got the bus back and stopped for some very bad Chinese fast-food. Once will be enough. 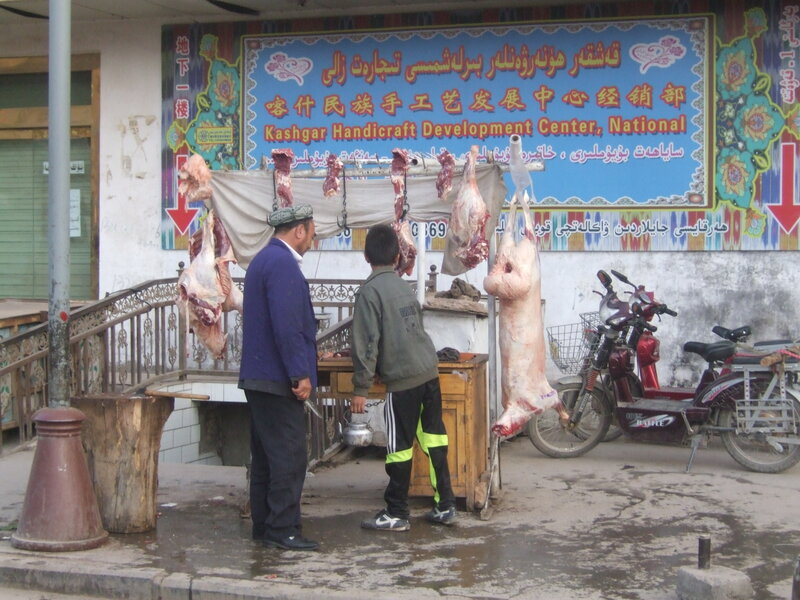 Have a bit of a list of things to do in Kashgar so I got stuck in by knocking a few of them off the list. Cleaned the tent and then cleaned the bike. Had a few fellow cyclists come over and give me a hand. One was from Scotland living in America who was a bicycle mechanic and helped adjust a few things for me. 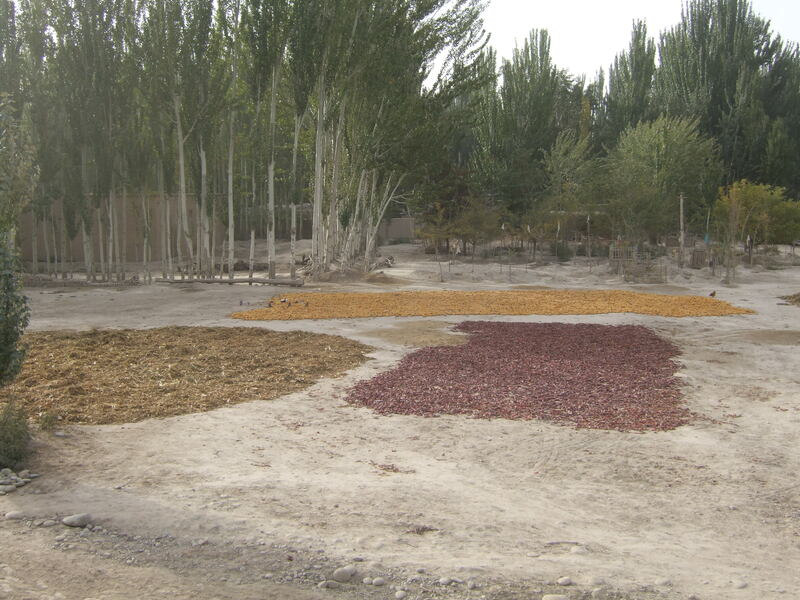 In the end I did very little in the 9 days in Kashgar. I got into a routine of going for chicken satay every day at the same place and then a trip to the bakery on the way back to the hostel. 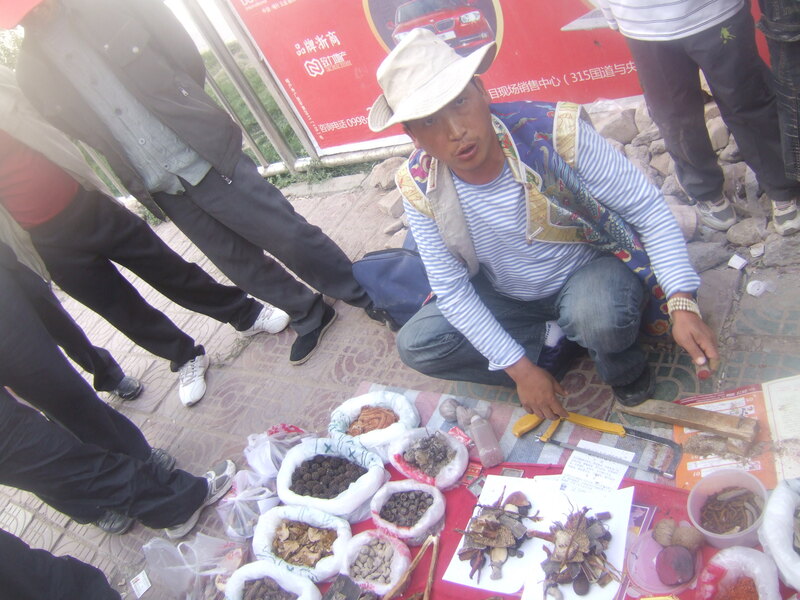 Came across a Tibetan medicine man just before he was busted by police because his medicine was made up of parts from protected animals. Treated myself to a 50 cent shave and if I had brought my own razor it would have been cheaper. Monday morning I had an appointment at the bike shop. But on the very spur of the moment I joined a small group heading 45 km out of town to visit a small village which had a good bazaar and a mausoleum. Tuesday morning I finally made it to the bike shop and got the gear cables replaced. 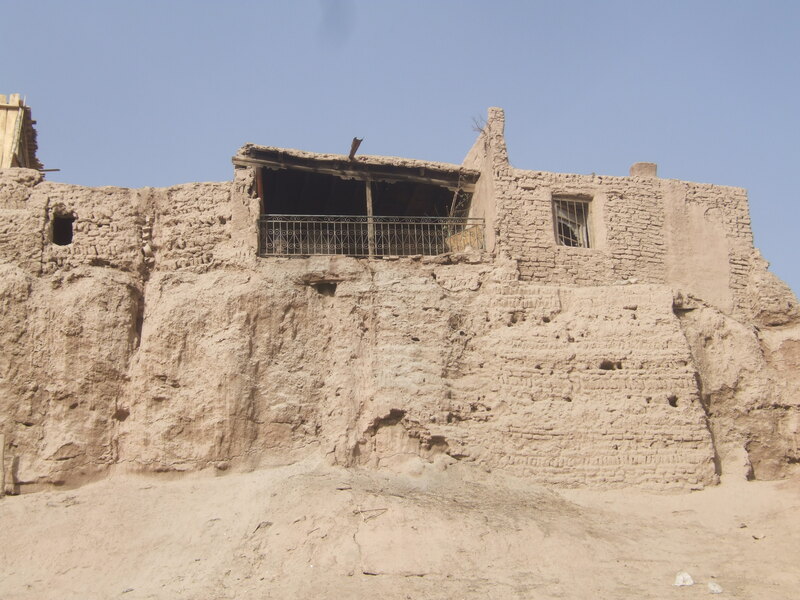 In the afternoon I went with the Austrians, Nora and Roman, for a walk to the old, old town of ruins and remaining mud houses. Cheeky Chinese tried to charge $5 so we went round the back. I finally bit the bullet and got back on the bike for a 2200 km journey along the Southern Silk road. 1500 km of that will be through the vast Takelamagan Desert. 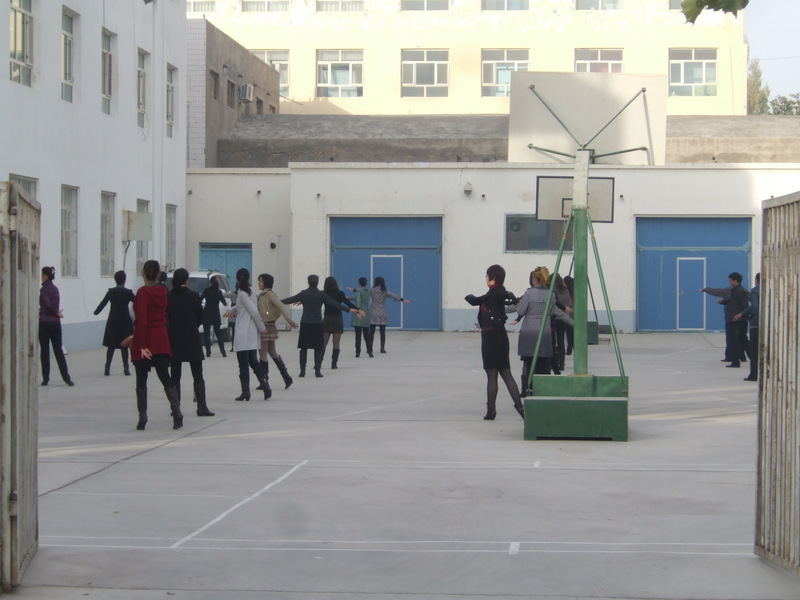 It is very daunting just how far the distance is in China. You could cycle for weeks and get nowhere. Cycling out of Kasgar the bike felt good after a clean and mini service. It took 15 km to get out of the city. I then got myself onto a brand new highway which was a pleasure to ride. The bike was just flying along. Sadly after 60 km the police caught up with me and threw me off. 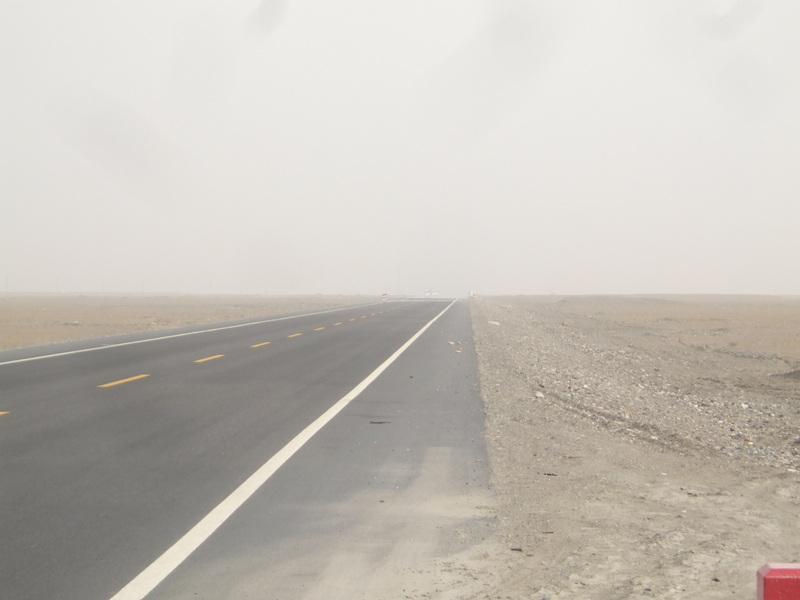 The road then left the agricultural area and moved into the desert of nothing but a continuous cloud of dust on the horizon of blowing sand. You never see the sun because it is always hidden by the sand. One good thing about the desert is that it is flat for miles and miles. Come 4:30 p.m. I had done 165 km which wasn’t a bad day’s work. I didn’t want to overdo it so I called it a day. 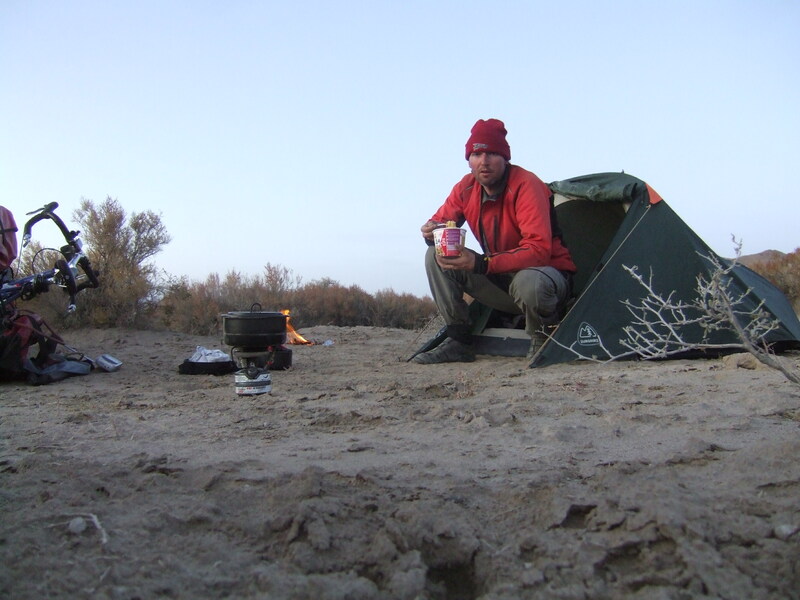 I pulled off the road and pitched the tent behind a small sand bank a short distance away. 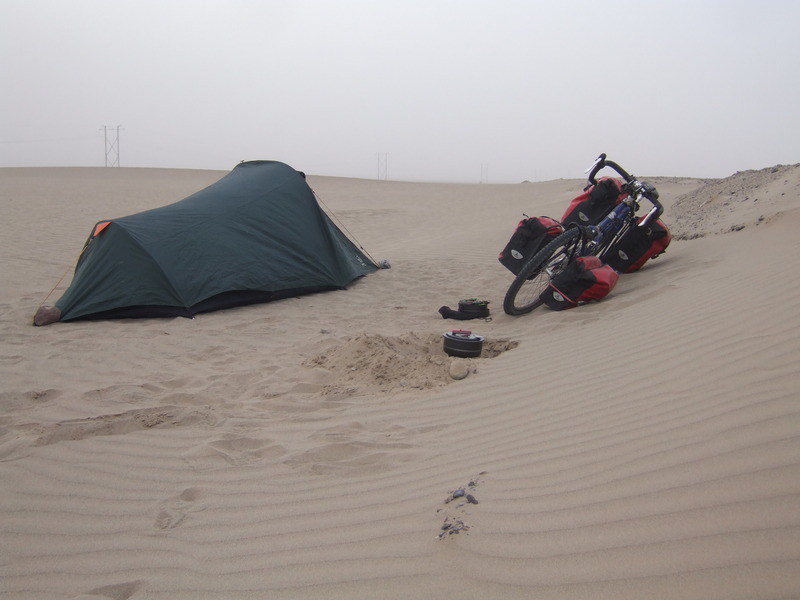 Never push the bike too far off the road because it is such an effort in the sand. I cooked some dinner and I was done and in bed by 6:50 p.m. Was pretty tired. 5 m down the road I got some relief as I came back out of the desert and I got myself back on new highway for a good 75 km stretch. It is so nice to ride a brand new seal and have the road to yourself. The new highway, literally cuts right through the heart of rural China as it passes through the crops. 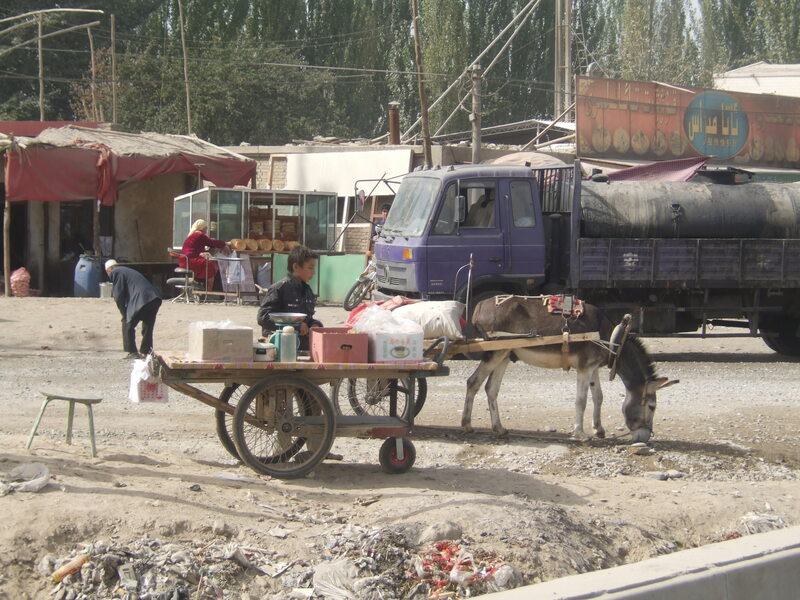 It is interesting to watch the locals go about their life with their donkey and carts. Sadly you can see where villages with their mud huts have been knocked down to make way for the highway. Around lunch-time I took the chance while I could to stop for some noodles and to get more water before heading back out into the desert. The bike always attracts the attention of the local children and there is always a smile when they spot my little Tuatara sitting on the back…………..sometimes a little warily because they are not sure if my little mascot is real or not. Going back out into the desert was tough. The wind came up and I was going nowhere fast. It was a real struggle. The dust wasn’t much fun and makes it hard to breathe. With China being so big, I have set myself a target of a minimum 140 km a day. So as soon as I reached 140 km I looked for a place to camp. 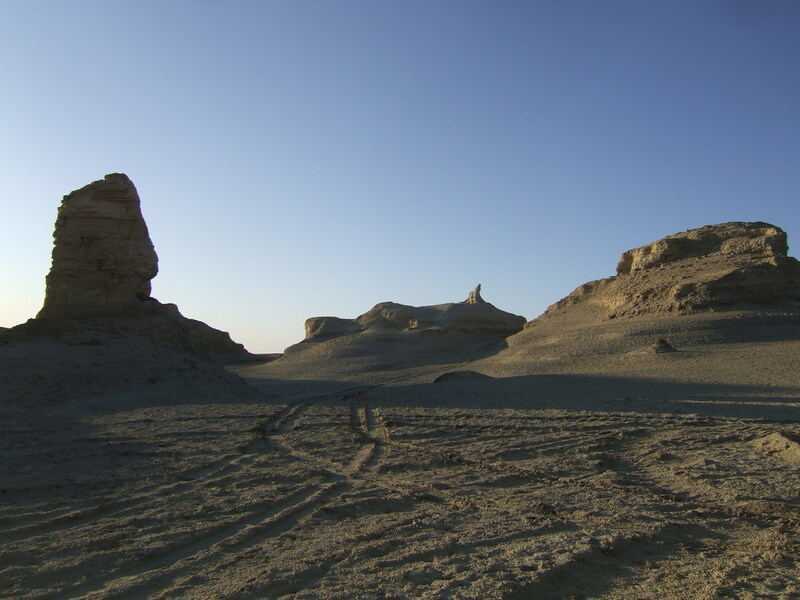 It was a little difficult to find a place because the desert is so flat and there is no shelter from the wind. I was a bit worried my little £17 tent might blow away. One problem I have at present is that I am carrying way too much food because I have been over cautious. I finally used up a packet of lemon couscous which I have been carrying since the day I left London and to get rid of a bit more weight I added a tin of black olives. I never thought when I started today I would be cycling 220 km……………………the most I have ever done in one day. Throughout the day I set little goals…I was cycling like a machine. After 4 hours I had cycled 100 km at an average of 25 kmph. After 5 hours I had done 120 km and after 6 hours 150 km. Surprisingly the pace wasn’t dropping and I had eaten very little today because towns had been scarce so I was on a diet of two pieces of fruit and a helping from the magic box of dried fruit and nuts and a chocolate bar. Come 4 p.m. I had cycled 165 km in 7 hours the wind came up and I was ready to stop. 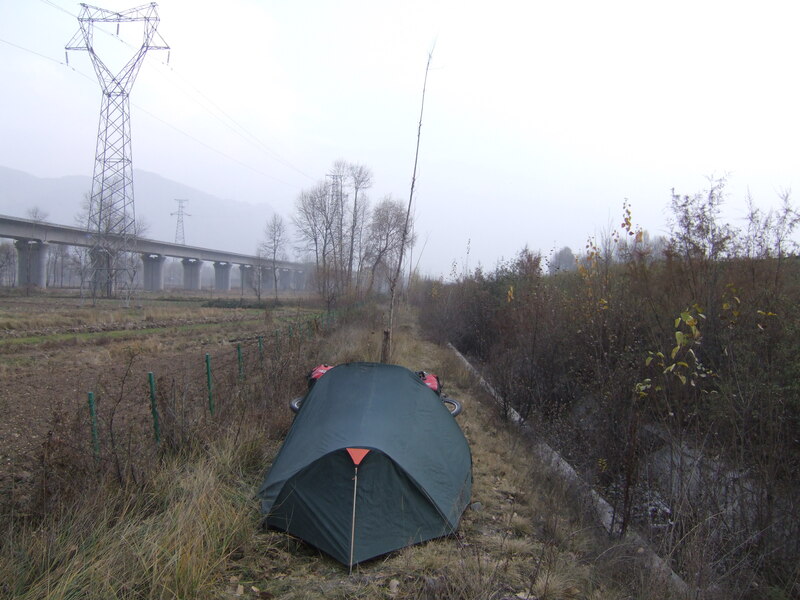 The plan was to camp 40 – 50 km from Hutian and then cycle into town in the morning for an easy day. But I kept saying to myself do another 10 more km and it will be easier tomorrow till it got to the point and I thought what the heck I’ll go all the way……………. I arrived just before dark and then spent two hours trying to find a hotel as many I tried wouldn’t take me because I was a foreigner. It was getting very frustrating and I was getting ready to set myself up in the city park. In the end I got a shifty room for $20 a night. Tomorrow I will have a rest day because in 3 days I have done 526 km and I don’t want to burn myself out just yet. After yesterday’s big day I have been a little stiff walking round town. I headed straight for Marco’s Dream café for some western food and had a chicken curry for breakfast with coffee and juice. I returned again in the afternoon to treat myself to a steak and chips. In between I found the supermarket and stocked up on fresh fruit and snacks for the next stint in the desert. Tourist-wise, I went to the Hutian museum which was very interesting with its many new and different artifacts. 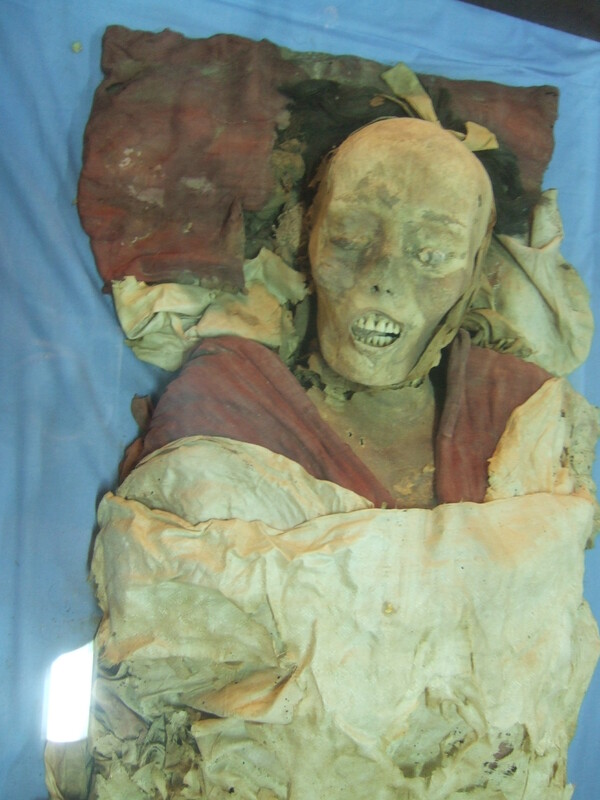 Its centre-piece were two very well-preserved mummies of two Buddhist nuns, dating back a few thousand years. I went to the internet café this afternoon as well. It was massive with about 200 computers. Internet is proving a nightmare in China. Everything is blocked and when I do get on a site it all comes up in Chinese so it is impossible to do anything. I need to find WiFi. Ended the day by going back to Marco’s Dream café for another steak. Just £3 it is a great deal I am making the most of. One thing I have noticed here in Western China is the high military presence. Heavily-armed soldiers in riot gear march through the streets. Truck loads of soldiers pass slowly down the main street as well as water cannon trucks with flashing lights, so as to be noticed. Normally when I am staying in a hotel, I find it hard to get away. I did well this morning – I managed to be on the road by 7:30 am. I am having to be a bit more disciplined. The days are getting shorter and I can’t afford to lose valuable cycling time. Not to mention I have a long way to go, 5– 6000 km to get across China on a 60 day visa which I will definitely have to extend. Still I will have to cycle at a quicker rate than at any other time on this trip. 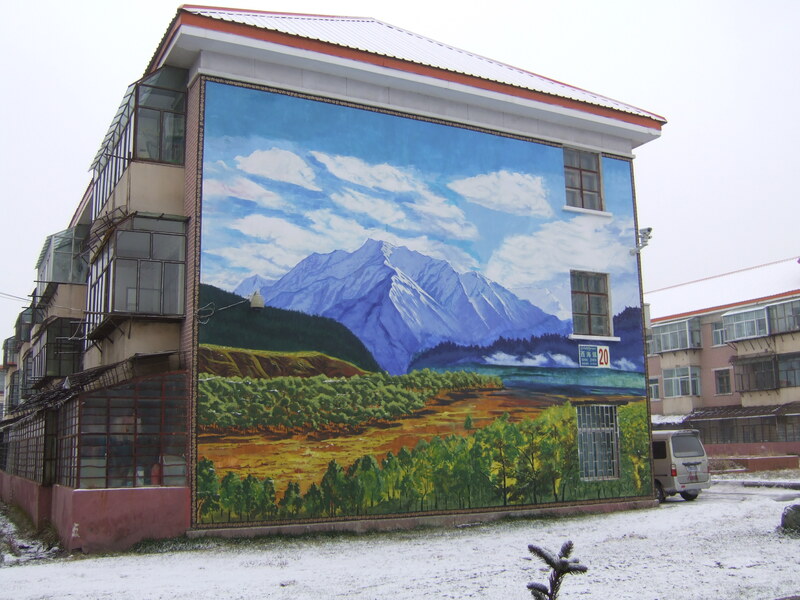 I cycled for 20 km before stopping in a small town on the outskirts of Hutian. I like the way you can pull up at the roadside bakers and grab some piping hot bread just seconds after it has come out of the oven and just a few seconds later it is going into my mouth. The bread here is flat and they add onions and a lot of salt to give it some flavor. Only had 60 km of desert today. But as always a light headwind. Just enough to slow you down. Shops and restaurants are few and far between. Finally found a restaurant for some lunch around 2pm. Had the standard Lukman (noodles, vegetables and a little bit of meat). I was pretty tired and had to have a lie down in the restaurant to the local’s surprise. No one bothered me. Quick power nap and I was back in to it for a few more kms. It was starting to get dark so I had to pull the pin. Once it gets dark it is pretty cold. So you don’t want to be hanging around outside. You just get the tent up and get in it. 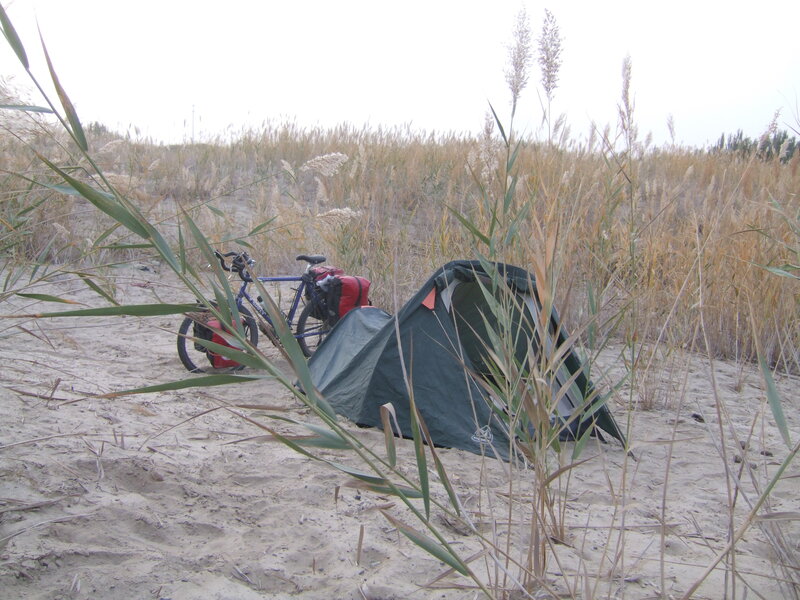 I camped just off the road amongst some sand dunes at the bottom of someone’s garden. I could hear voices close by………. I was well hidden and I don’t think they ever knew I was there. The mornings are fresh and the hands go completely numb while packing up the tent and putting everything away. It is becoming continuing unpleasant to start the day. The cycling day now starts with 3 layers, woollen hat and gloves……….as yet I am still in shorts. After 26 km I reached Yurtian. I passed the Bazaar on the outskirts and was then subsequently passed by every man, women and dog with their wares piled a mile high heading in a long stream in the direction of the bazaar. 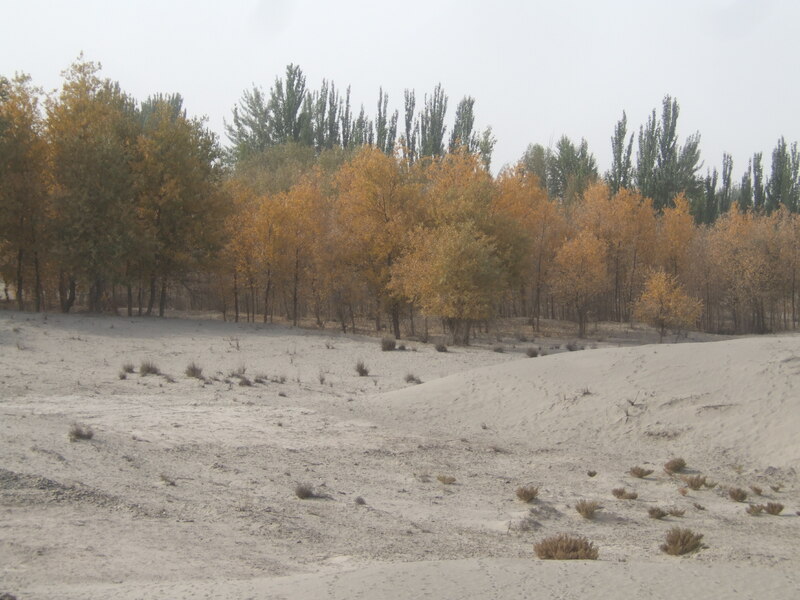 Then it was back into desert and 108 km to next town. Had more headwinds to contend with. Saw some camels running wild. Knowing it would be another 106 km to the next town I had the standard Lukman and stocked up with food and water before cycling out of town and stopping at the first possible moment, which was among some bushes in a dried-up swamp mash. May not have been so dry because the place was swarming with mozzies. before I could head back out into the desert. But before I could do that I had a puncture to repair and a demonstration for the locals who had gathered round. 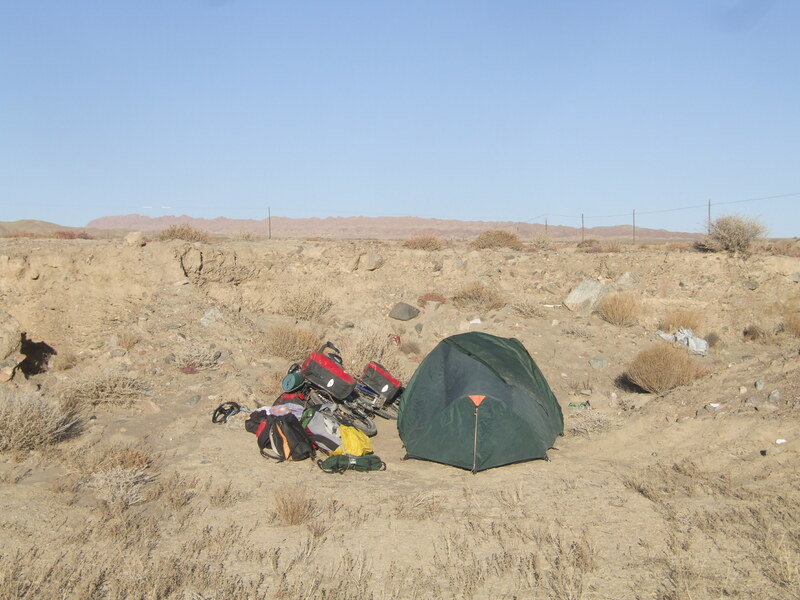 I said goodbye to my new Chinese friends and cycled less then a km out of town before pulling off and setting up camp among the sand and bushes. I did stop every 30 mins for rugby updates of the New Zealand v Australia world cup semi final. Wishing I was in a pub watching the game. At least we got the result. 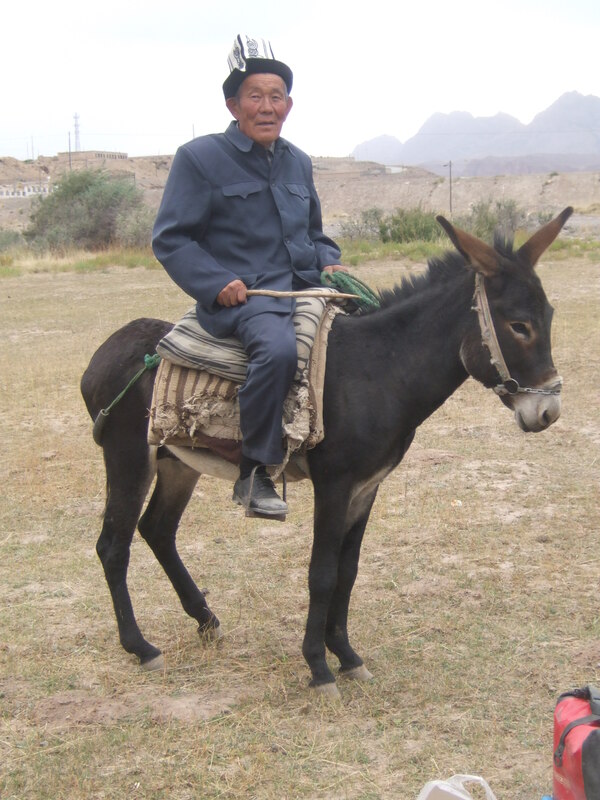 After day 7 out of Kashgar I completed 980 km this week nearly double the weekly average. Has to be same again next week. 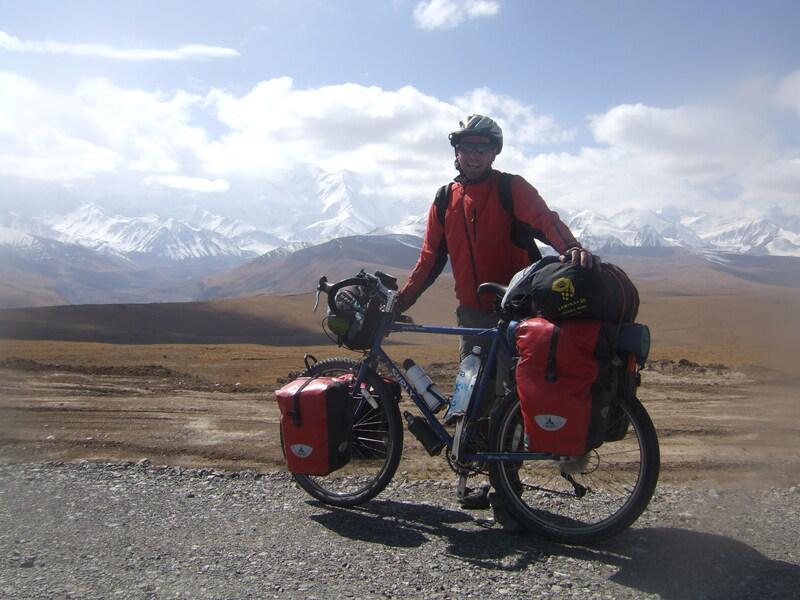 1200 km down…………only another bloody 5000 to go………..and maybe some big mountains to cross. At 4000 metres there will definitely be snow. Not sure if I want to risk it………..the alternative is to stay on the flat for a 700 km detour. After being stress free for so long. The stress is starting to return. The previous two nights had been cold. But I hadn’t needed to wear my thermals. I was hoping I wouldn’t have to wear them till it really got cold. I awoke in the night freezing. I felt my skin and it was cold all over. So I had to quickly throw my thermals on. I always get them out every night so they are close at hand, because I don’t want to be outside the tent trying to fish them out of the panniers. Winter is coming to China and I think there will be some hard months ahead. The last week I have had lots of time to think while cycling long stretches of nothing. It can be quite demoralizing. The wind, long cycling days and when you look at the map it looks as though you have gone nowhere. It only got worse today. My favorite compass setting is South East. This is the optimum line for New Zealand. Shame the last few days I have been heading on the road North East. So in fact getting further away from New Zealand. 146 km and I thankfully reached Qiemo. The tell-tale signs indicating a town is coming up is you start to see animals grazing along the road and a few more people coming and going with their donkey and carts or motorbikes and tractors. The best thing you can see is street lights which means you are approaching a decent town. 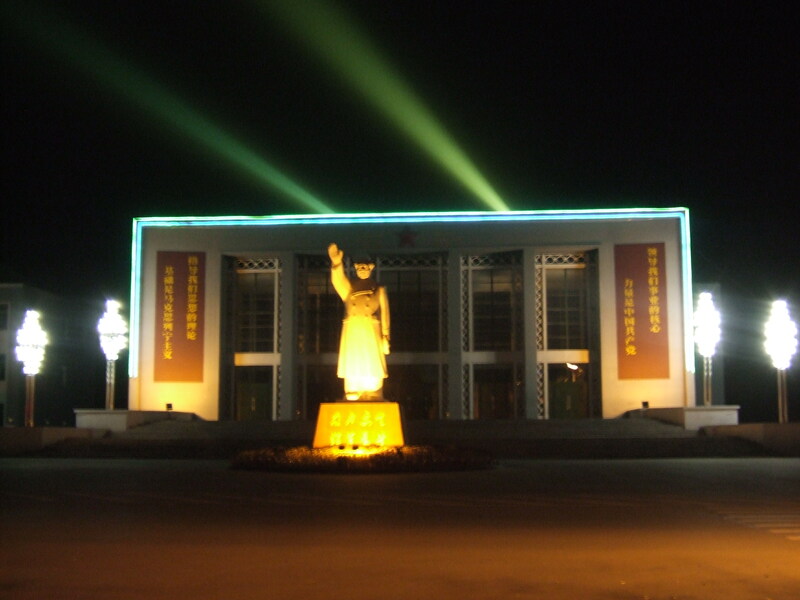 I am glad to say Qiemo has street lights. This will be the last big town for about 1000 km. So I need to stock up well. Some of the distances between towns will be over 200 km. So I need to be well prepared. Ending in a small world story, I ran into the two Swiss guys I had cycled to Kasgar from Kyrgyzstan. 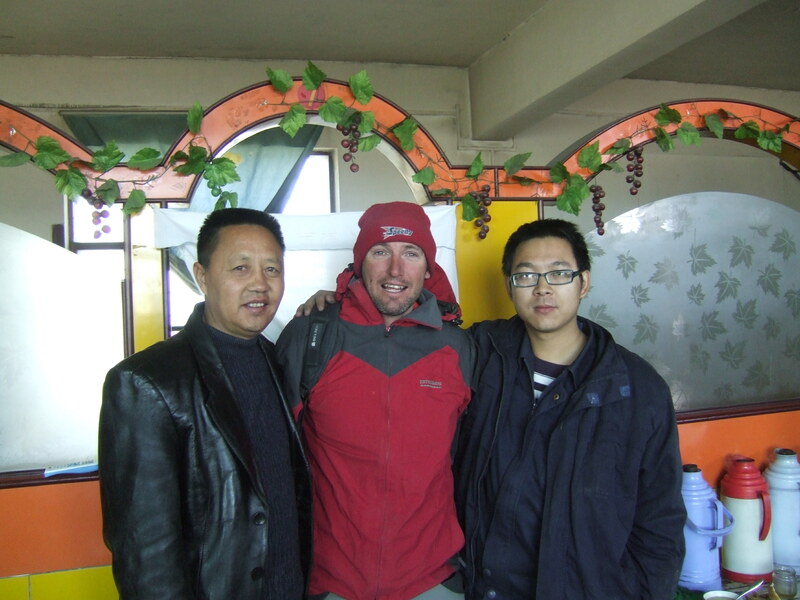 They had left Kashgar 5 days before me. In just 8 days I had caught up with them after 1100 km. Tomorrow they are continuing by bus. 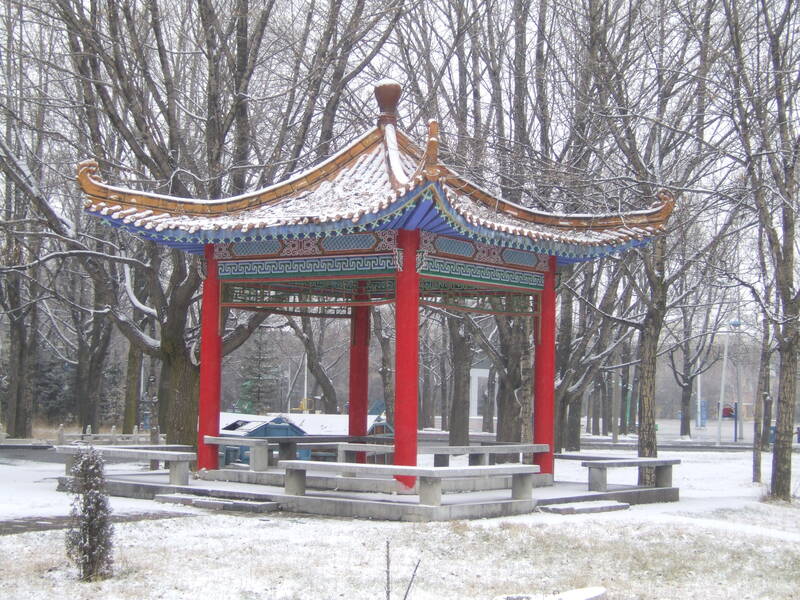 Days 200, 201 &202: Qiemo – rest days. Since the Swiss left this morning. I have become the only Western tourist in town. 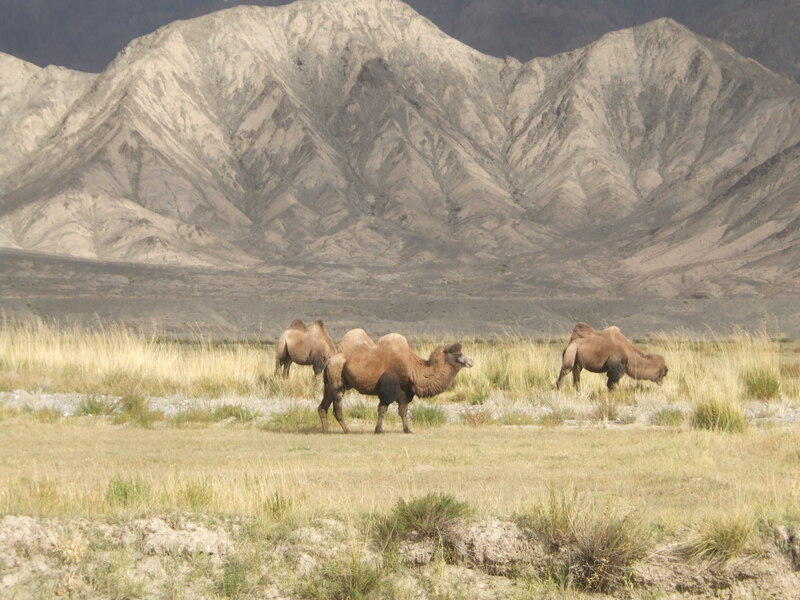 I don’t think Qiemo sees many tourists because most people take the Northern Silk road to Urumqi. Rest days never start off as a rest because you are always busy washing and shopping for food and water, catching up on internet. Had to go to a few places to get my cycling shorts mended. Got the big wave off at the first place I tried. Everything is made in China….but you still can’t get everything here. I have been looking in vain for a highlight pen to help with my map planning and a tin of pineapple. My favorite food after a tough day it helps lift the spirits. Fitted another 60 cent shave in as well. It’s so cheap so in China I may never shave myself again. I might as well throw my razor away. After waking up cold in the desert the other night I invested in a new blanket and some extra gloves. I’m very wary of what may lie ahead. While looking for the blanket I had a local guy and his wife kindly come shopping with me to help barter a good price. He spoke good English and worked at the court house. She worked at the local museum. He had a police car and they took me out for lunch and afterwards we visited the museum, which was very modern and very interesting. It had some more mummies from the desert and something that caught my eye and got me worried were pictures of the desert covered in snow. It looked really nice. But I certainly don’t want to see it firsthand. That evening, in what I can only describe as a foolish move, I was talked into going out for a quiet drink. I knew I should have said no. The guy from the court brought two of his police mates and a quiet night was not part of their plan. They wanted to drink wine and beer mixed…………but I wasn’t having any of that. I did instead have quite a few beers. Hence to say I didn’t manage to leave the next day. So I spent my extra rest day at the internet café. Tomorrow I get back on the road knowing it will be 200 km to the next town. I must have still been feeling the effects of the alcohol from the two nights before because as I was leaving town I realized the sun was on my left side, which was bad because it should have been on my right side as I headed east. So frustratingly a bit of time was lost as I had to cycle back into town and then out the other side. The first 40 km was through the fertile farm land. 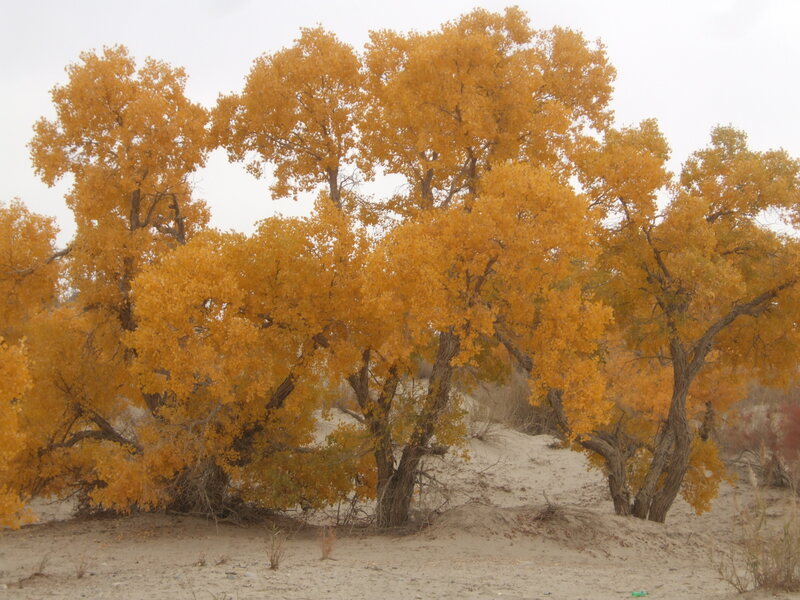 The colour of the autumn leaves was a pretty sight before going back out into the desert and battling headwind. That night I camped in sand dunes a short distance from the road. I finally reached a town and stopped for a hot lunch. A large group gathered around the bike. I didn’t mind too much until they started touching the bike. Ringing the bell and changing the gears. I became a bit agitated and a change in my tone of voice sent them scattering. The mountains to the South had a sprinkle of snow on them, which may be a sign of things to come. In Tajikistan I couldn’t find any muesli for breakfast…so as a substitute I brought some baby formula. I never used it. So tonight it was great for a 5 minute meal. For the third straight day I had a strong headwind to battle. The desert is flat, wide and open and there is no hiding from it. You have to stop more often because it is extra tiring. It is typical that as soon as you stop for the day, the wind stops as well. I really struggled today just to get 100 km. In the afternoon I had 5 miss calls around the time of the end of the Rugby World cup final between New Zealand and France. The only persons who at present has my China number is my cousin Debbie and her French husband Frédéric who offered to give me updates knowing I would be in the middle of nowhere. I feared the worse thinking his persistence was surely to deliver some bad news. I knew it was close because I got an update on the BBC that after 63 minutes it was 8-7 to New Zealand. I was very relieved when on the sixth call I picked up and received the good news. Camping out in the open is freezing at night. I found a large hole I could put my tent up in, a few hundred meters from the road, and where I was quite nicely hidden. 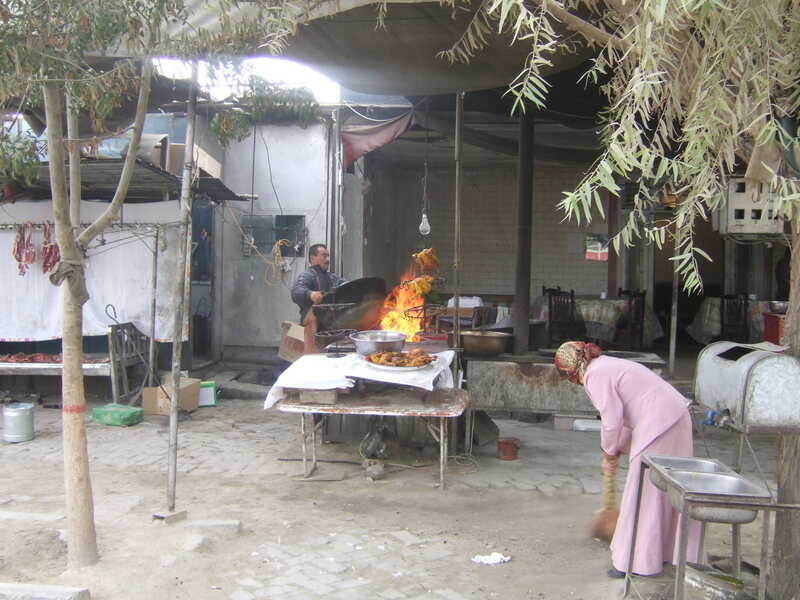 For dinner I pulled out another 5-minute meal from Tajikistan. A Polish guy had given me some dry freeze potato and cheese . Quick meals are the essence. Once the sun goes down it is so cold. I get in that tent and don’t come out till morning, No matter what. 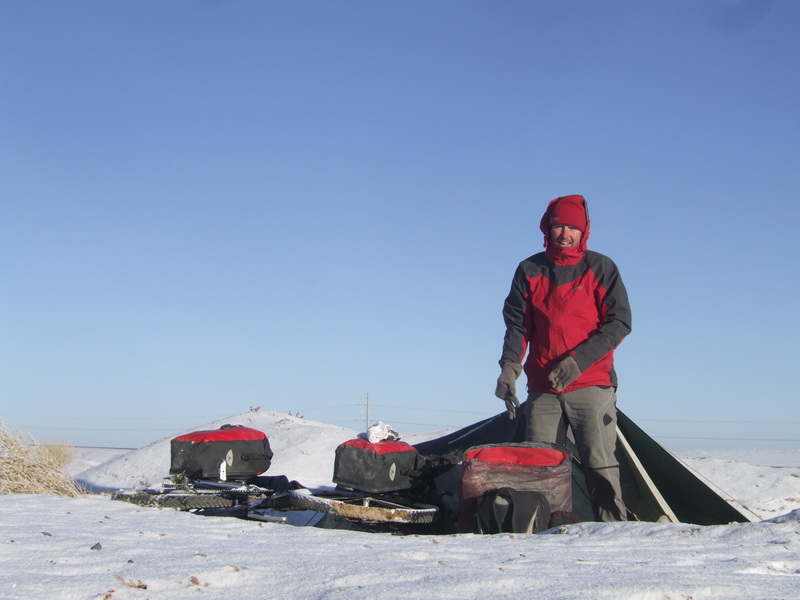 My tent is dying – the zip on the door has broken and I can’t shut it properly. This means I can’t stop nasty bugs from getting in and camping in the desert means the tent is constantly full of sand. While I was camped down my hole, during the night I heard the screeching sound of a car braking and then the thud, thud, thud. I was half asleep and wasn’t initially sure what I had heard was real. I listened and heard nothing. A couple of trucks passed and they didn’t seem to stop. Shamefully, I didn’t fancy getting out of my tent to investigate. 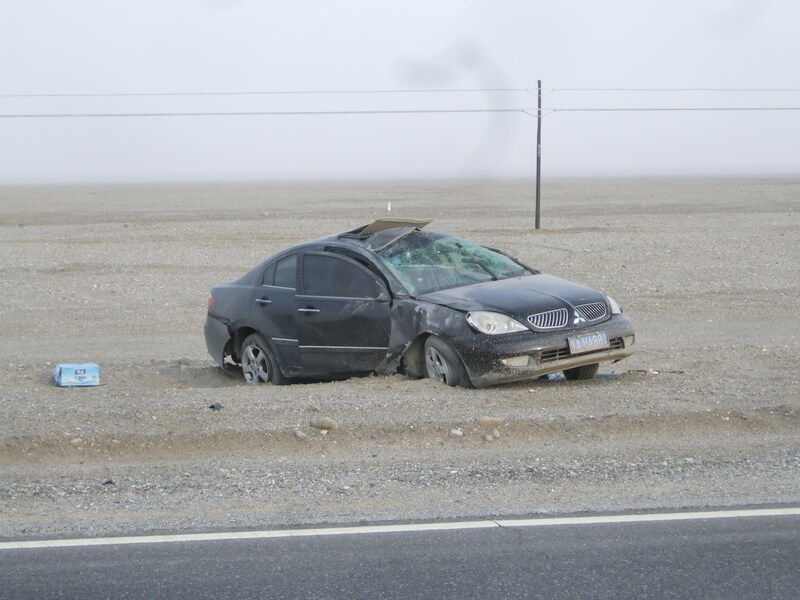 In the morning only 400 metres down the road was a damaged car a few metres from the road. On the road was another car on jacks with a wheel removed. I hadn’t dreamed what I heard and the other car had obviously had to swerve to miss the broken down car and ended up off the road. After two weeks I finally moved out of the desert and into the mountains. It is cold all day as I slowly climb higher and higher. I camped tonight at 3500 metres. The day didn’t start well. It was a very cold morning with frost on the tent. It’s horrible packing everything up. The fingers go so numb. Worse was I had flat tyre number 8. I wasn’t going to fix it …………it was too cold to be mucking around. So I just pumped it up and got going. I didn’t get far before I had to pump it up again after 15 km I decided I’d better fix it. Disaster struck when I tried to pump the tyre back up and the bloody pump broke. So I was completely stuffed. I had a little air in the tyre so I decided to push the bike in the hope I would find a town soon. But after 5 km and just before the 3600 metre summit it started to snow……………..I made the decision then to flag down the next vehicle. Credit due, the very first guy I flagged stopped. He had a 4×4 with only space on the back seat. I took the wheel off the bike and we managed to squeeze everything in. Just as well I got a lift because it was 60 km to the next town. It would have been nice to cycle because it was all downhill. The town was a rough looking place with some type of mine close by. At least they had a garage and I was able to pump the tyre up – but the worry is if I get another flat tyre. I will be stuffed again until I can buy a new pump. It was a very cold morning. Water bottle was completely frozen. I passed a salt lake as I started to climb again. Stopped in Youshashan which is an oil town for breakfast. It is nice to have at least one proper hot meal a day. For the second day in a row someone paid for my breakfast. Yesterday they had paid and left without me even knowing till I tried to pay myself. I stopped at 4 p.m. because it was getting very cold. It is so important to cook and be in the tent before dark. What a day. I was very cold in the night camping at 3500 metres. Surprisingly, I woke not to find a frost……but 1 ½ inches of snow. I got straight back in the tent and back in the warmth of my sleeping bag . My metal water bottle had completely exploded with the cold. I didn’t stay in bed too long and bit the bullet getting out and packing everything up. Was very cold and uncomfortable. My feet were freezing standing in the snow. It was a beautiful day completely clear blue sky. I started with a nice downhill. Only got 11 km before the bike started to feel funny and then I realized it was another bloody flat tyre. It’s always a tiny little bit of wire which has come from a truck tyre after it has blown. This time it wasn’t so easy to get a lift. I had to wait 45mins before two guys who work for China Petroleum pulled up. They took me the 9 km to the next town where thankfully they had a air hose. The two guys were very enthusiastic and virtually repaired the puncture for me. I set off but didn’t get very far because just down the road I noticed the guys heading into a restaurant and thought I’ll have some of that. So I joined the guys for breakfast and afterwards they offered to take me a bit further if I want. So I thought why not. I’d had enough for the day. So we loaded the bike back on and set off. I actually felt really guilty and the scenery looked really nice. Making good progress felt good. The problem I have with crossing China is that I only have a 60 day visa for the 5 – 6000km journey. I should be able to get an extension to my visa. But it will still be tight. 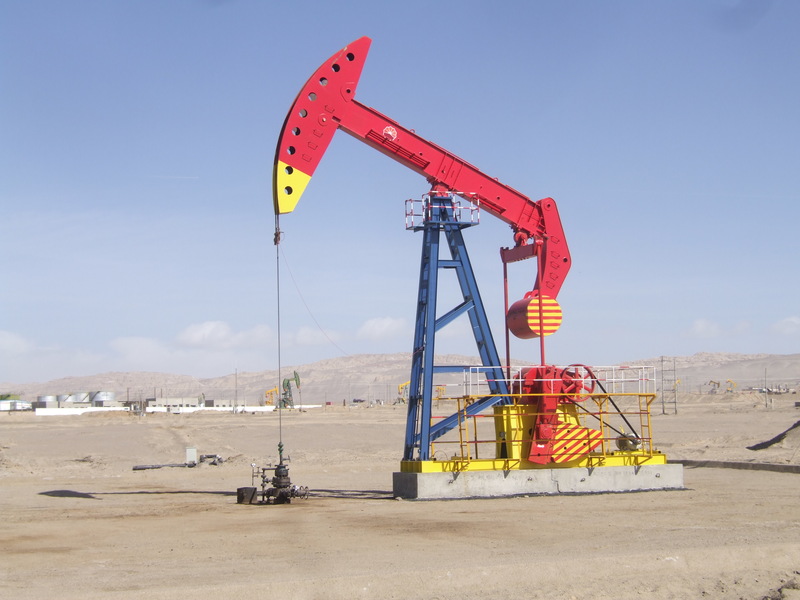 After 180 km we pulled off the road as they had to go and inspect an oil well 25 km in land. The road was rough and I started to regret it as my bike bounced around on the back. They did their stuff and then took me a further 190 km. We arrived into town late and had trouble finding a hotel. Problem was none of them would accept foreigners. So in the end I had to sleep in the pickup. The guys came and got me very early. The back tyre had gone down again so we had to find a pump. They told me not to get out of the pickup. I then told them I wanted to stay in this town another night. They told me it would be difficult and that I would need to go to the police. So in the end it was just easier to leave.. I told them I couldn’t leave till I had more water and food. Next town is 208 km away. So they helped me get sorted . The road was good. Mostly uphill though. It was a really nice clear day. But very cold below zero all day. 3700 metres was the top of the pass. I had a little headache so knew I was getting high. Finished the day with a good 15 km downhill. Had to stop early because it was so cold. Made a nice hot water bottle and treated myself to a bar of chocolate and a fruit jelly. 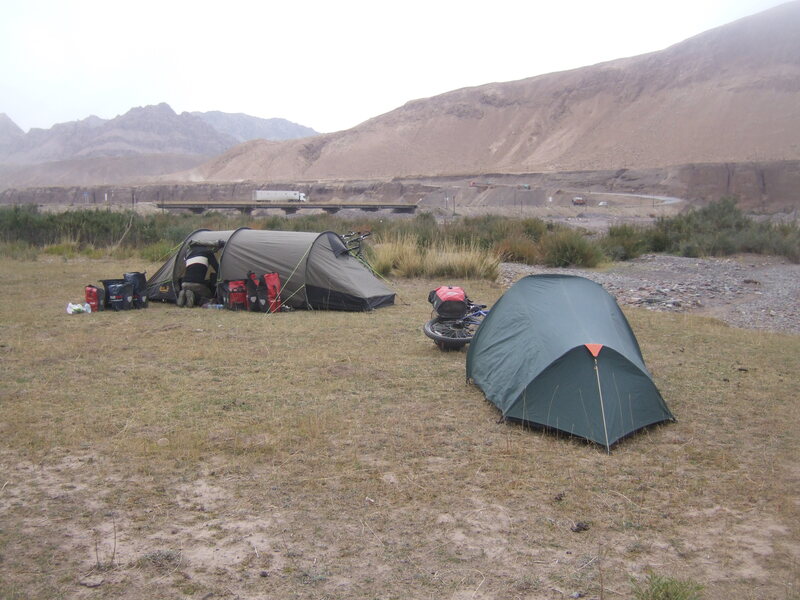 Camped between the two roads at 3400 meters. After 9 days on the road I was dying to get to a decent town. Deiingha was just 82 km away. After 1 hour of 32 km downhill it was a lot closer. 15 km from Deiingha I was stopped by traffic police. Normally I just wave and keep going. This time I had to turn around and come back. They said I had to wait while they made some phone calls. Eventually I had to speak to a police woman who spoke English. She broke the bad news to me that Deiingha was forbidden by Chinese law to visit, let alone stay. I think it must be a city with a lot of ethnic unrest. She told me if I entered I might be detained. I continued my journey and had little option but to go into the Forbidden City. Firstly I needed petrol for my gas stove. I then needed more food and water. The next town is 130 km away. So I wasn’t going to get my shower today. I stopped for a hot meal as well. While I was in the restaurant I wondered if my bike parked outside would attract the attention of the authorities. A solider came in and looked at me surprised. When he left I wondered if he would be coming back with friends. When I did go to leave I got bloody lost and I cycled past the police station. I thought this is good and just kept going. On the way I cycled into an older part of town with a bit of a bazaar and as soon as I saw the fruit stand I was over there, I haven’t had fruit for a week and I crave it. Buying fruit soon grew a crowd. It really was as though they had never seen a foreigner and this may be true. I quickly moved on. I was a bit disappointed I couldn’t stay. After 9 days of no electric I am nearly out of power for my Camera, GPS and computer since I haven’t been able to charge anything. 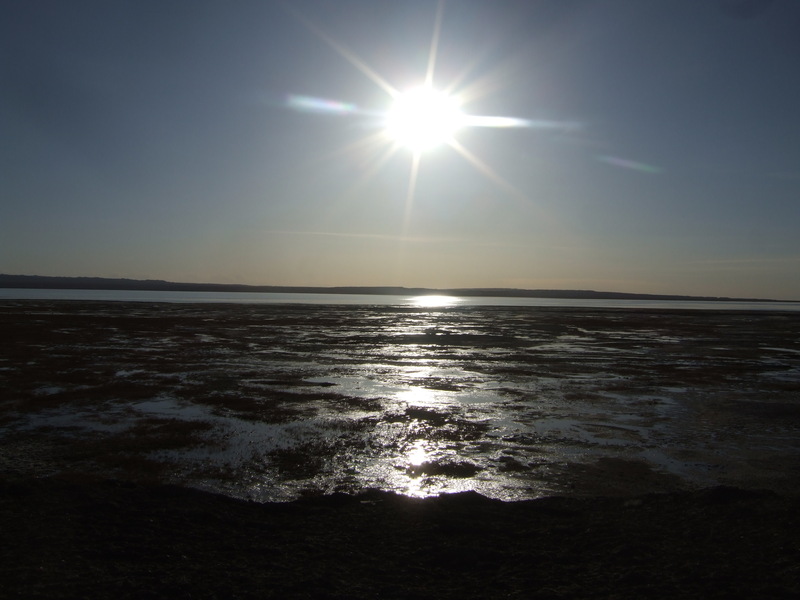 I went on to do another 40 km before I came across a big salt lake and wetlands. It was full of birds. There was absolutely no wind and the sun was out. It was warm for a change. It was only 3:30 pm…………………I thought I’m stopping anyway. I set up camp, made a little fire and cooked some dinner and for a change the night wasn’t even cold. It wasn’t cold last night, but it was very windy. After coming down the day before it was all up and up today. I ended up doing a few unnecessary kilometres because went on the new highway they are building and when I got to Wulan, I realized the new highway was a bypass. Eventually I was able to go off road and get under the railway line and back on the old road so I could cycle the 3 km back to town. The first hotel wouldn’t take me. Usual story no foreigners allowed. Second hotel wanted $60 and to put me in a deluxe suit. So I left there and went to the police. Discovered I had to register and that the Wu Lan hotel was the only hotel foreigners could stay in I explained I only had $10 and not $60. The police took me over to the WuLan hotel and got me a room for $15………..still paying too much. Finally after 10 days without showering – I’m sure that is the longest I have ever gone – I am clean………………..but there was a delay when I discovered the hot water didn’t come on till 8:30pm……………I went mad on hearing this………..and they suggested using the kettle. This city has a different feel. It is predominately Mongolian. Walking through the old parts of town, many houses have a flagpole with many colourful ribbons. There are lots of Buddhists here as well. I had another 50 cent shave. I’m really enjoying not having to shave myself. The gas stove has been playing up so I took that apart and cleaned it. Haven’t been able to find any Chinese food. Have had to settle for noodles and more noodles. 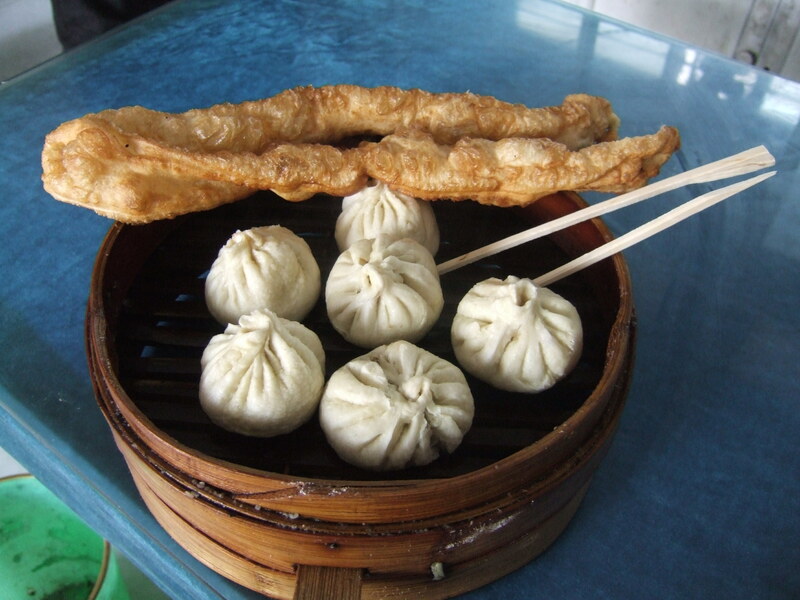 I have been able to find steamed dumplings for breakfast which makes a nice change from noodles. The supermarket here has been great. Nice to have some variety and a wider selection. The Internet has been a waste of time. My little green tent has had a reprieve. I was able to get it fixed in a bike shop of all places……………but I couldn’t get a new pump for the bike………………..so I am still pump-less and at the mercy of the road. No punctures please. Would of thought that after a few days off I would be nice and refreshed. But from the moment I left Wulan it was hard going. I am starting to pick up a few niggles and I’m getting a few aches and pains. I don’t think the cold is helping. I started off slowly. But I just couldn’t get going. I also guess the constant headwind doesn’t help either nor the fact I was climbing uphill all day. The cold slows you down as well as saps your energy. I finally got to a historical site I could visit…………..just 100 m from the road and not the usual 20 km. 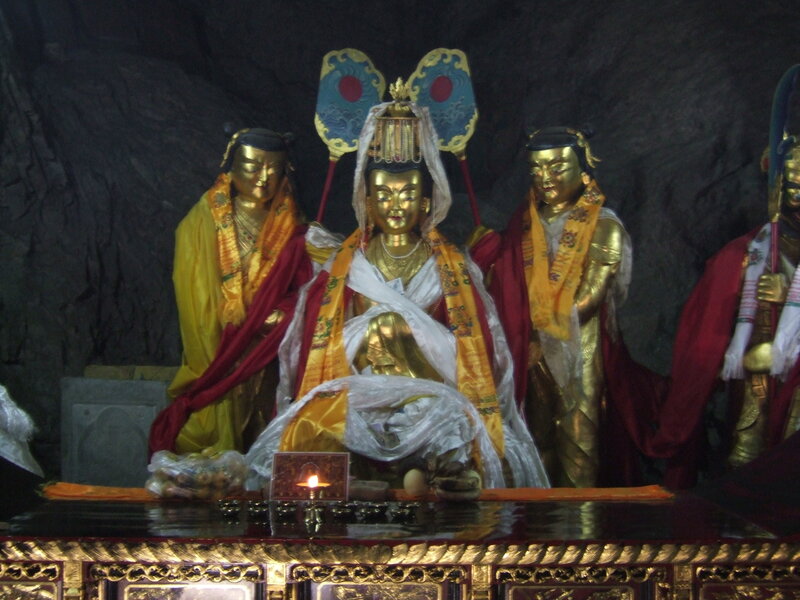 It was a temple that led to a shrine in a cave and it was very cool. Continuing on I reached the top of the 3837 metre pass. I felt sick and wanted to vomit. To mark the top were a few tepee-shaped structures made out of many colourful ribbons. This is the first time I have seen this in China and I think it must be part of the Mongolian presence. I felt a lot better getting down the other side. 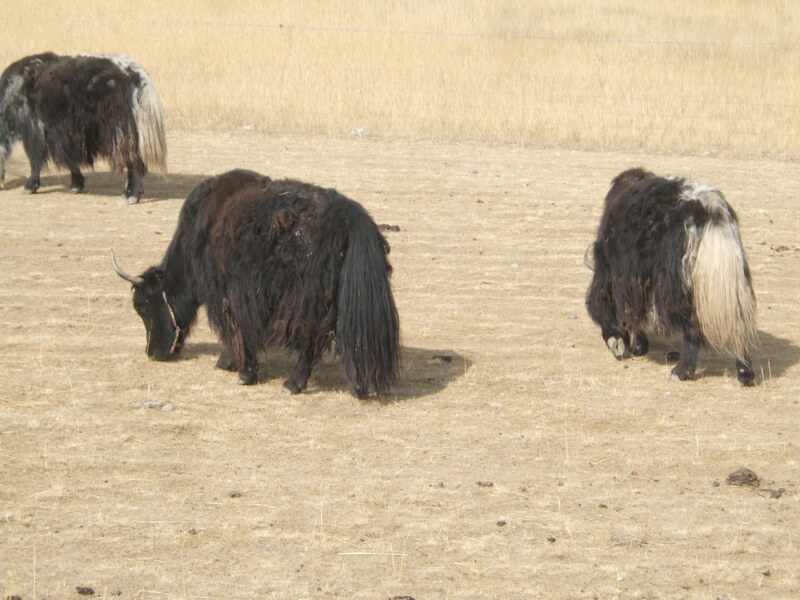 It opened up into wide pastures and I saw my first yak. The road is often fenced either side so sometimes it can be difficult to find a gap you can get through so you can camp. Kilometre wise it was a better day. 55 km and I finally reached the largest lake in China. 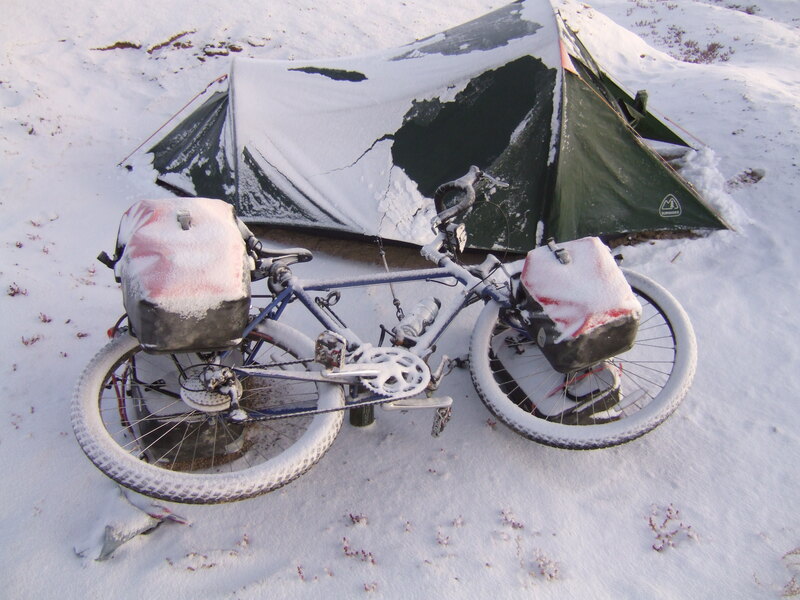 I had wanted to camp there yesterday……..but fell well short. It was a shame I only got to cycle along the lake for a short while before pulling away. One of the strangest things I have seen on this trip was three guys had flat bits of wood strapped to their knees and hands. I passed them on the road They would take 6 steps, lay flat on the road with arms wide out, jump up and clap their hands above their heads and then repeat the process. I saw them come pass again some 45 min and a few kms down the road after I had set up camp in a field. I camped at 3300 metres last night and this morning when I got up I found it had snowed again. freezing and I whipped my shoes off and rested my feet against the pot belly stove. It seems a lot of restaurants just have one set meal. For the second day in a row I got liver and noodles………………..which is such a disappointment as I am not a fan of organs. So I left slightly hungry. It was very cold all day with the temperature not rising above zero. When I got to Xihaizhen I was like an ice block. The plan was to have a hot feed and move on. But I decided just to go for the easy option and got a hotel instead. It snowed overnight…………but lucky for me I was in a hotel. I had a lazy start to the day. Was in no hurry. It was very misty and cold. I went out and had some steamed dumplings. When I did finally get underway it was a nice downhill run through the valley. 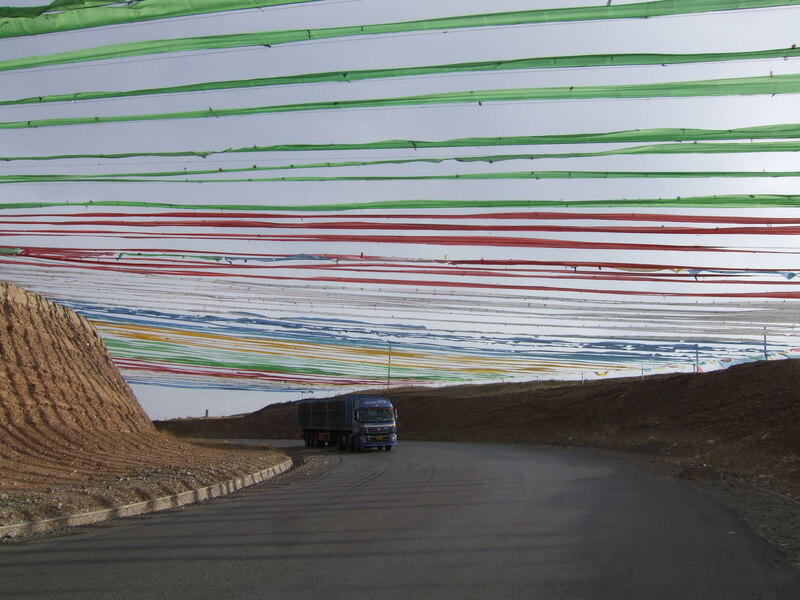 I inadvertently got on the Xining expressway……………..I was only following the signs for xihaizhen. It was good until I got to a 25 metre tunnel………….which when I got closer to the sign turned out to be a 2.5 km nightmare. The hard shoulder disappears in tunnels and you are left with a little footpath. I wasn’t game to cycle through the tunnel. So got off and pushed my bike the 2.5 km…………..which took forever. 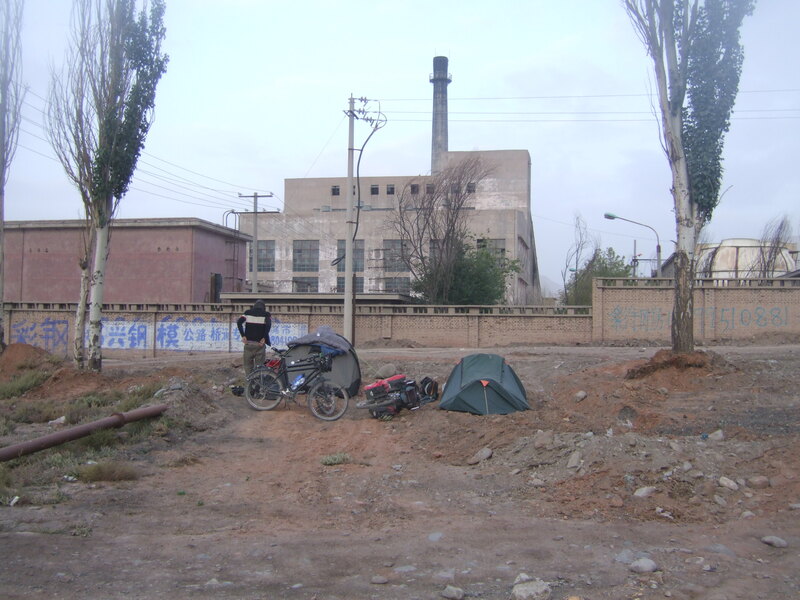 Once I got past the sprawling city of Xining I was keen to camp. Problem was getting off the motorway. There were no exits. Eventually I spotted a track down a bank. So I took everything off the bike and carried it over the barriers and I ended up camping down a bank beside the motorway.